Plantago Major.�It grows in meadows and fields, and by pathsides. It is also called Way-bread, and Way Broad Leaf. The leaves are bitter and astringent, and have been long held in popular esteem as a wound herb. They are used as an external application to ulcers, and indolent scrofulous tumours. The root has been found useful in intermittents. A mucilage prepared from the seeds has been found beneficial in the catarrhal and mild inflammatory form of diarrhoea. The juice is excellent for pains in the bowels; it restrains fluxes, spitting of blood, bloody urine, proceeding from an ulcerated bladder, and bleeding wounds. A decoction of the roots sweetened with honey or sugar is excellent in consumption, allaying. cough, etcetera. It is also good in ague. The herb (but especially the seed) is effectual against dropsy, falling sickness, yellow jaundice, and obstructions of the liver and reins. The roots of Plaintain and Pellitory of Spain, beaten into powder and put into the hollow teeth, take away pain. The clarified juice, or distilled water, dropped into the eyes, cools inflammation, and clears the sight, and dropped into the ears, eases pain and removes the heat. The bruised leaves form a good application for burns and scalds. The juice mixed with lard is a good application for the piles. The juice mixed with oil of roses, and the temples and forehead bathed with it, eases pains of the head arising from heat, and is very applicable to lunatic and frantic persons; to hot gouts in the feet or hands, especially in the beginning. It is good to be applied where bone is out of joint, to hinder inflammations, swellings, and pains. The powder of the dried leaves taken in drink destroys worms One part of plantain in decoction,and two parts of the brine of beef, boiled together and clarified, is a sure remedy to heal spreading scabs, or itch in the head and body, also ringworms, the shingles, etcetera. It is remarkable that it is the chief remedy for the cure of the rattlesnake, for which discovery an Indian received a great reward from the assembly of South Carolina. 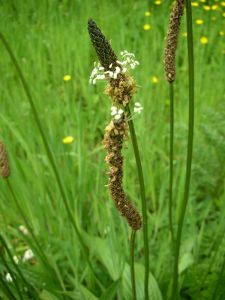 There is another species of Plantain, called HOARY PLANTAIN, Plantago Media. The leaves are small, and less blunt than in the last, hoary, lying close to the ground. Its Medicinal Virtues are much the same. The seeds boiled in milk are laxative and demulcent. Boyle recommends an electuary, made of fresh Comfrey roots, juice of Plantain, and sugar, as very efficacious in spitting of blood. Plantain juice mixed with lemon juice, is an excellent diuretic.